It can be exciting to start your first adventure into ecommerce. Selling a product online opens you up to a global marketplace of people that are willing to pay money for the goods you offer. Even more exciting is the idea that transactions will be able to happen seamlessly, allowing you to make money instantly and easily. Right? There’s a lot that goes into getting a successful ecommerce shop set up. 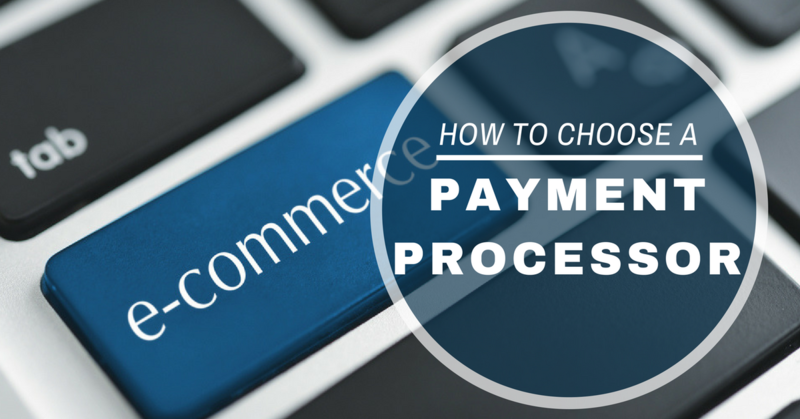 One of those is choosing a payment processor to ensure that you can accept payments online. First things first: what is a payment processor? A payment processor executes a transaction by acting as the intermediary of data between the merchant, the merchant’s bank, the consumer’s card, and the consumer’s issuing bank. Once the payment card details are verified, the payment processor then relays the information back to the merchant’s payment gateway and ultimately the merchant, who can then complete the transaction. Accredited payment processors are required to meet PCI compliance requirements. Ecommerce merchants should do their homework on each payment processor to ensure they meet the required compliance standards. Also consider what additional security features are offered. Just because a security feature is not required to be compliant does not mean it’s not the industry standard. In working with a payment processor gateway, you will want to consider how it will interact with any other pieces of your online retail platform, like your backend shopping cart solution. If your ecommerce stack has lots of bells and whistles, you’ll want to be sure that the gateway you choose will play nicely with each of them. Not enough can be said about the importance of fraud prevention mechanisms in ecommerce. The card-not-present space is rife with bad actors looking to scam merchants. Choose a payment processing partner that offers guidance and tools to help prevent fraud. The right payment processor can help you find a customized set of fraud tools that can be tailored to your business’ unique needs, including automated tools, chargeback prevention, and tools to identify suspicious transactions. When choosing a payment processor, be sure it has a payment schedule that accommodates your business’ cash flow needs. Thanks to technology, most processors are fast and the funds can be available to you within hours. However, in some cases, it could take several days for transactions to process before the funds become available to you. Be sure to review with the processor. Support is an important factor when choosing a payment processor. There may be times (like during the busy holiday season) when you need readily available tech support. Be sure you choose a payment processor with high support availability, even 24/7. You never know when an emergency may strike and the reliability of your payment processing support team could mean the difference between a happy customer and a lost transaction. Read the fine print. It’s important to understand how rates work when determining the best payment processor for your needs. This is especially true for online merchants, who ultimately end up paying the high “non-qualified” rates. Be wary of hidden costs and fees that may pile on top of your base rate. Consider the pros and cons of all the different pricing types, including flat-rate, interchange plus, and tiered pricing. Look into the different payment methods and currency types accepted through the payment processor’s gateway. At a minimum, this should include all major credit card brands and PayPal, though you may want to consider other ways your customers will prefer to pay. If you cater to an international audience, you’ll also want to be sure that your payment processor accepts other currencies. Global customers should be able to see the price of your products in their local currency. This goes hand-in-hand with ensuring that support is on point. You want to choose a payment processor that is going to work with you as a partner, not simply treat you as merchant #984897. Look for processors with a history of forming relationships built on trust with other merchants. Solid partnerships are important, and your ecommerce shop can run much smoother with a payment processor that is aligned with your business goals. Reliability, flexibility and affordability are key when choosing a payment processor. Each ecommerce shop has its own unique needs, and you should find a payment processing partner that can accommodate your business model. This choice will play a key role in the success of your online store, and should be given due consideration.